Highly-rated Derry City winger James McClean has completed his move to Premier League side Sunderland for a guaranteed fee of £350,000. 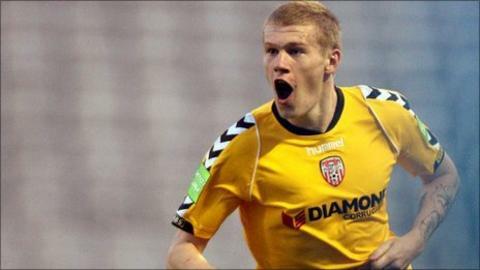 McClean completed a medical on Monday and then finalised personal terms after Derry accepted the offer from the English giants. The 22-year-old has been a target for a number of English clubs this summer, with Peterborough United making two offers for the player. McClean has signed a three-year deal. Wigan Athletic had also expressed an interest in the player, who scored 18 goals in 73 appearances. His impressive form has resulted in a first call-up to the Northern Ireland squad for the Euro 2012 qualifier against the Faroe Islands, but he informed manager Nigel Worthington that he wished to declare for the Republic of Ireland. Sunderland manager Steve Bruce said: "James is an outstanding young talent and has rightly attracted interest from a number of clubs over the summer so we're very pleased that he sees his future at Sunderland. McClean becomes Bruce's 10th summer signing.